Aileen Erin leads the pack with book seven in the Alpha girl series, BEING ALPHA. The story starts out on Tessa met Dastien honeymoon in the Caribbean. Tessa is supernaturally attacked and the couple head home to Texas to investigate the occurrence. Tessa and friends cannot catch a break. So much has happened in this series in a very short timeframe. Just when they think that everything is finally going to settle down, something else pops up. The supernatural community is a mess, and it is up to Tessa to stop an apocalypse, no pressure. Thank goodness she has a lot of reliable friends. I love the addition of Samanth Lopez and Eli. Both have interesting qualities and add a lot the novel. I’m looking forward to seeing how they evolve in future stories; especially Eli, who stirred up some things at the end of the novel. I am really looking forward to book eight, LUNAR COURT. Tessa has grown tremendously throughout this series. She still fights the idea of becoming an Alpha, despite the fact that she’s a natural at it. She is an amazing character that does not give up and puts others before herself. 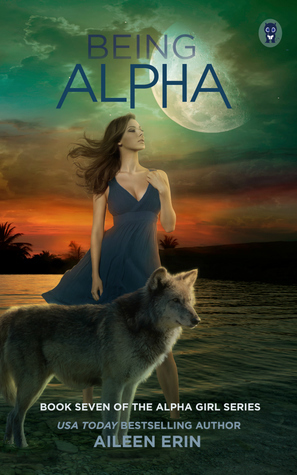 Aileen Erin did an astounding job with BEING ALPHA. It is full of non-stop action. It is thrilling from beginning to end. The story was original and interesting throughout. Followers of the Alpha Girl series will love this novel. I voluntarily reviewed an advance reader copy of this book. Sign into Goodreads to see if any of your friends have read Being Alpha.